Okay, I’m really going to do this. I want a place to write out my thoughts and feelings without having 950 of my closest friends on Facebook reading it. There may come a time when I post a link on FB but for now, I’m fine being here in my own little corner of the world. This month….October 2013…..I’ve been saying that I can’t wait to get this month behind me. And while that is true, I will also remember this month for as long as I live. It’s the month that my precious Son had his brain operated on. I don’t know that I have fully dealt with the emotional impact of that yet, although as I sit here and type, I am feeling the water beginning to pool in the bottoms of my eyes. 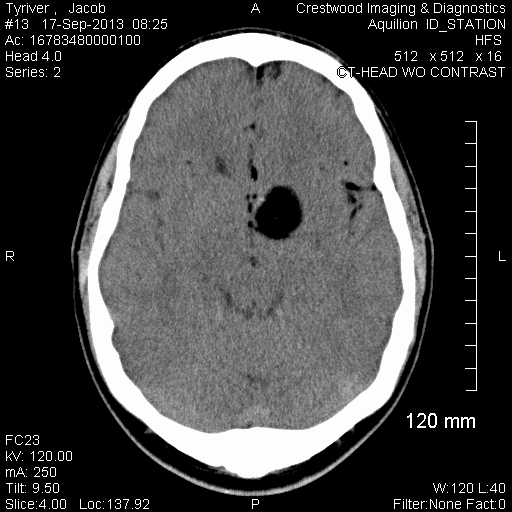 September 17th, Jake went for a routine xray and ct scan of his head and sinuses. Frequent headaches had intensified so our very thorough doctor sent him for tests. Before he could even leave the Imaging Center, doctors had spoken to one another behind closed doors. “Have you ever seen one of these?” “Maybe once during residency but I’ve never worked on one.” “What about you?” “Wow, this is my first!”. Jake was told by the radiology assistant to see his doctor in one hour. Thankfully he had the foresight to text me so I quickly got out the door to meet him. Our Doctor walked in and said, “well, there’s good news….it’s more than likely benign, but the bad news is that you have a brain tumor.” Typical for our family, the brevity of that didn’t set in for a bit. Instead, imitations of Arnold Schwarzenegger “It is not a tumor!” from Kindergarten Cop occurred. Excuses as to why he’s so forgetful, “See, Mom….I have a brain tumor!” Reasons to not help in the kitchen…..”I can’t do dishes….I have a brain tumor.” It all took the place of us dealing, truly dealing with the fact. Jacob has a brain tumor! Internally, I wanted to scream. Sit in the shower and cry until there was nothing left. I wanted to rewind the clock and have a major redo! I wanted it to disappear! I never asked “why?” though. My sweet friend Tammy taught me that lesson as she bravely endured her battle with pancreatic cancer. “Why not me?” Exactly,…..why not him? Why not us? It was what it was. There were so many times after the diagnosis that I wanted to cry. I could feel the tears coming but somewhere, somehow, I managed to keep pushing them back inside. If I started, I may not stop. And what about Jacob? HE was the one with the unwanted tumor. HE was the one who would have his skull cut open and his brain opened! HE was the one who would be in such pain afterwards. And he….my amazingly strong, God-fearing, committed to Christ son had a peace about him that was remarkable. He never lost his spirit. Never questioned God. Never worried over any piece of this. Immediately felt confident in the choice of surgeons (whereas I worried, “was I doing enough???”). Jacob displayed humor and grace throughout so how could I fall apart? My 21 year old son was handling it. Mama needed to as well! Two weeks to the date, Jacob had surgery. Up until this point, we had told only maybe 10 people about what was going on. The Sunday prior to his Tuesday, October 1st surgery, we went to the altar at our church. We didn’t grow up with altars and although we had joined friends of ours who went to the altar for prayer, we had never ever gone forward for ourselves. It was a huge thing for us but we went because we wanted the people closest to us to pray with us. I wanted people to lay hands on Jacob. To pray for healing, to pray that he would simply be OK! We will never know who knelt with us that day, but we know that we were surrounded in love. We heard tears and felt hands and heard whispered prayers. Afterwards, we turned and with blurry eyes, we hugged those who stood closest to us. Again, we’ll never know who all was with us at the front of the church that morning of September 29, 2013 but we felt the prayers of the Saints! The night before Jacob’s surgery, we decided to post on Facebook. It would be obvious to everyone that he had had surgery simply by the scar on his head. There were family and friends that we hadn’t had a chance to talk to yet. How would they feel not knowing?? So, the evening before, I posted on Facebook asking those who prayed to fall on their knees with us in prayer. I briefly explained what was going on and boy, we were overwhelmed by the support. Friends shared our request and soon people that we didn’t even know were praying for our Son. Hundreds of people praying that he would be OK. We are forever grateful for the prayers and love shown and our words cannot express it enough! !